Gas furnaces and hot water tanks that vent through a masonry chimney require an approved gas liner. Gas liners for a furance are inserted from the top of the existing chimney and fed down the flue to the point where the furnace pipe enters the wall. This is usually located in the basement. The furnace pipe and/or hot water tank are connected together and inserted into the liner. A metal sleeve is inserted at this point to prevent contact with the cement. 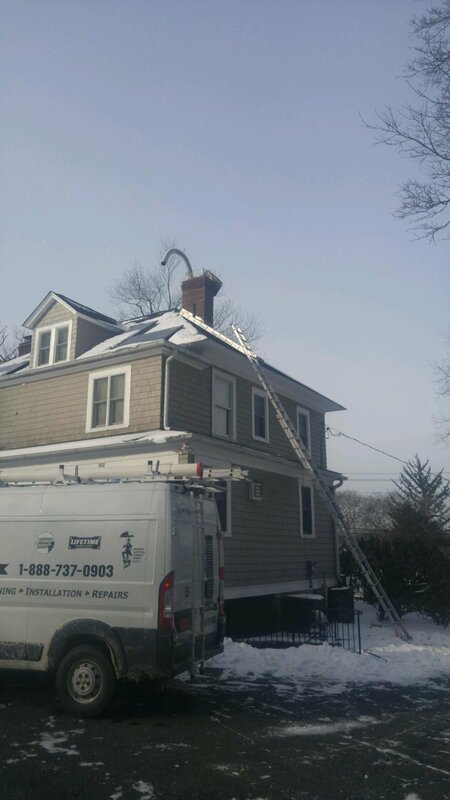 The liner at the top of the chimney should be properly flashed and capped. It is important that it is not cemented at this point to allow for expansion and cleaning. Oil furnaces require approved stainless steel liners with a base-T.
Oil liners for a furnace chimney are made of stainless steel. They are inserted from the top of the existing chimney and fed down the flue to the point where the furnance pipes enter the wall. A base-T must be inserted where the furnance pipe is connected. The liner should be properly flashed on the top of the flue and the cap should be removable for cleaning.